Do you have a hard time transporting your heavy kegs? 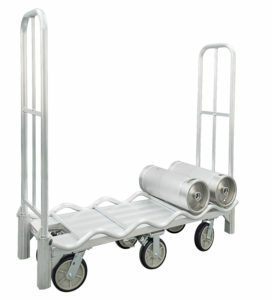 New Age Industrial may be able to help with their keg dollies and carriers. 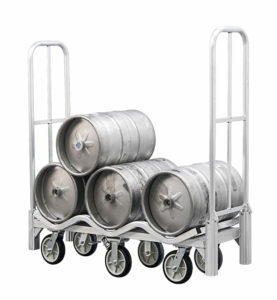 Their all welded keg carriers nest securely on their BDT trucks for safe transport. New Age offers two different size carriers – the 51753 holds up to (6) 15.5-gallon, half-barrel kegs and the 52064 holds up to (15) sixth-barrel kegs. The sixth-barrel kegs are typically your craft barrel size kegs. The carriers are easy to install without the use of tools and the keg carrier can easily be removed when not in use. They come with a LIFETIME GUARANTEE against rust and corrosion and a 5 YEAR GUARANTEE against material defects and workmanship. For more information on the keg carrier click here! If you’d like more information on the BDT truck units (sold separately) click here! Contact our New Age Brand Champion, Kristin Bishop for any questions!